My whole life I have been told that the world is a spherical ball orbiting around the sun. I am pretty convinced at this point that this is true. But I am open to evidence to the contrary. There are so many concepts and ideas that I have been taught throughout my life. Most of them were explained to be gospel truths. I was told these truths were unchanging, unquestionable and incorruptible. For a good while I believed them. However, there came a point as I reached the age of reason that I started to question. This began during my early teen years, so you could very easily refer to it as the age of unreason… or at least being unreasonable. But as the cracks began to appear in the impenetrable walls of reason I had been brought up to believe in. So I began to question to unquestionable, and I found these ‘truths’ to be falsehoods, or at least false for me. I have met many people that lead wonderful, happy, productive lives based on these ideas that they hold true. I am very happy for them, but their truths didn’t work for me. Over time I’ve questioned and rejected, or at least altered, many ‘truths’. I have found my own path, my own power and my own purpose. I’m not mentioning any specifics intentionally. My truths and falsehoods will not be yours. And if I get specific I would probably alienate someone that needs to read this message. The point of this message is not to tell you what is truth and a lie. That’s not my job. I’m here to remind you to not get complacent. As I look back over the changes that have happened in my thinking in since I had children, the shift becomes more obvious. I am a totally different parent than I thought I would be. I practice ideas daily that I wasn’t even aware of before I had children. Some things that contradict how I was brought up, and some things that line up perfectly. Ideas have life and living things evolve. Trapped in a cage an idea will die, or worse become sickly and unhealthy. You have to allow room for your ideas to roam and travel. You must allow ideas to grow and change. If everything we already knew prepared us for everything that is to come in the future, there would be no room for growth. There would be no value to our human experience. So that is why I say that the world may in fact be flat. I’m open to evidence in that direction. But for the time being I will allow the world to keep spinning on it’s ‘supposed’ axis. I don’t know everything, and the things that I do know are fluid. 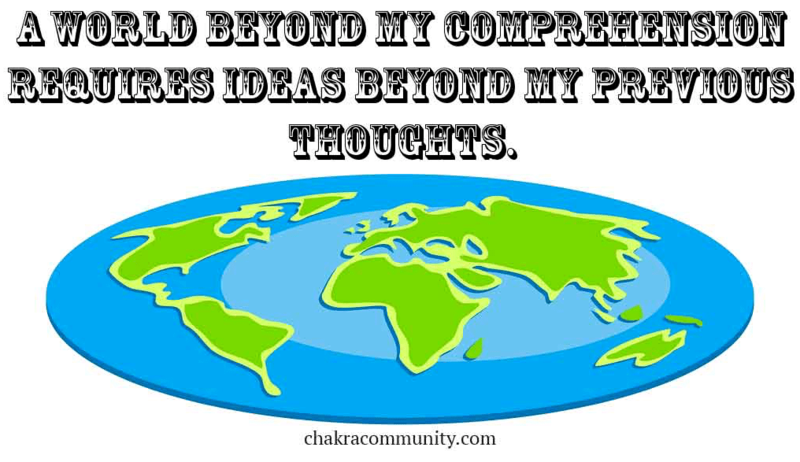 A world beyond my comprehension requires ideas beyond my previous thoughts.